For a couple weeks, I have wanted to write on a few different topics, but I feel as if my words have come up short. The honest truth is that the fear of failure is sneaking back up within me and I have greatly doubted my abilities in this blog. I am pretty sure I am under a spiritual attack and my mind is getting hit the hardest. I am going to just lay it out there today and I am praying that God does a work within me through it. One of the more difficult aspects about writing is that it feels like you are being split open…it allows everyone to see what is inside and honestly, that is a bit scary. That risk worth taking lays within the fact that maybe one of you will be able to relate with how I am feeling today and that is where I have to trust in God to take over and do His thing. Do you ever feel like you are doing a task that you are under qualified for? Over the past couple weeks that is how I have felt with this blog. Once I decided to go ahead with it and felt like it was the right time, I was eager to start. “Lord, if this is what you want from me, give me the affirmation to let me know.” He responded to that. I prayed for God to use me in this way and to give me the words to say. My heart and mind were excited and I wanted to please God with everything in me. That hasn’t changed. I still do. I felt like Peter stepping out of the boat onto the water and thinking I could just walk right on top of it like it was no big deal. “Lord, I will obey and walk into this unknown territory, even though it is something that I have never done before or feel like I can do well.” My faith in Him and His work suddenly drove out the fear that had previously grounded me. Now…I am feeling like Peter where he realizes what he is doing and becomes afraid and starts to sink. I am scared, doubtful and wondering, “What in the world did I get myself into?” In a mistake of comparing myself to others – a total joy killer – I am quick to feel that they have a much more artistic way with words than I will ever dream of. I just feel so ordinary and unqualified for this. What if I misjudged the Holy Spirits’ speaking to me? What if I misread those signs of affirmation that I asked for? What if everyone sees me fail? Who am I to think I could actually do this and people would be interested? I often read that writers are those who love words so much that they can hardly put a book down. I have never been an avid reader. The older I am getting, the more I desire and enjoy reading, but I was never that child who always had a book in her hand. Nope…I was an outdoors girl who didn’t mind getting dirty. I was more interested in wanting to see whom I could go off and play with than spending my time alone with a book in her hand. As I sit here now, the Spirit is reminding me about the past 6 years and how I have lead our First Kids Christmas Program, an average of 110 children in K-3rd Grade. One summer day, I was reading in our church newsletter and noticed that they were looking for a director for the Children’s Christmas program for that year. I quickly felt the Holy Spirit speak to me that I needed to do it. But logically it didn’t make any sense. For starters, I have a really undesirable singing voice. Like seriously. The thought of even singing in front of children made me cringe. Even my own children ask me to stop singing to the radio in the car sometimes. 🙂 (If we turn up the radio loud enough though, it is OK). I admire people who can sing and really wish God would of given me that talent. As much as I love music, when He created me, He choose to leave that one gift out. Secondly, my plate was very full. Ethan was in 1st grade at that time and Noah was a busy 24-hour care. He was constantly sick and we spent many days in and out of the hospital. So, I tried to shrug it off and put the idea completely out of my mind. Besides, I had heard from previous people who have done it how much time it takes and how much work it was. I wasn’t scared of the work, but I certainly didn’t feel like I had the time. One sunny afternoon a few days later, I pulled into the church office parking lot. I know the good Lord was watching me and I imagine with a big smile on His face for He knew what was coming. As He would have it, she was there working that day. I asked if they filled that position yet, and she told me “No”, and I let her know that if nobody else came to ask about it, then I would do it. A while later, she contacted me and shared that no one else came to offer to lead it for that year, so I accepted. I knew that the Lord would have to help me find the time and to let everything fall into place, and you know what, He did. And 6 years later, here I am…still the most unlikely person to do the job. Through it all however, I have learned a few things. The most important being that God can use the ordinary, under qualified, and most unlikely person to do His work. No, He didn’t miraculously give me a desirable singing voice, but we can play a CD, crank up the volume, and teach the music that way. I realized how much I love working with the children and using my creativity in other ways to tell the story of Jesus’ birth again and again. I love watching the excitement of the children when they learn the songs and seeing their confidence build as they get in front of the audience to act or sing a solo and realize that yes, they can do this! It does require much time and dedication, but He has taken care of that as well. Even in the midst of great stress at home over the past 6 years with a sick child who still requires 24-hour medical care, months of hospital stays – many in the ICU, many sleepless nights from lack of nursing help, countless days of doctors appointments and therapy schedules, death of close extended family members, long work hours for my husband, and I starting at school full time to care for Noah, among other responsibilities, He has allowed bits of time to open up for me to work on the programs. To my delight, He has blessed each and every one. Then, in the quiet of the night, when the kids and parents have all gone home, the decorations and set all torn down and packed away, I am filled with thankfulness and joy, which is my great reward. Sitting here, I feel the Lord telling me that as long as I keep going in obedience, then I am doing the right thing. Even if I feel ordinary and under qualified, if I am true to myself and do the best that I can, then that is all that matters. It is OK if my words aren’t as artistic as the others. I am being real and trying to be the best me that I can be. I want you to know that if I can do this, you too can do whatever it is that the Lord is asking of you! In Matthew 14, which tells the story of Jesus walking on the water, Peter yells out to Jesus, “Lord, save me!” Jesus responds, “You of little faith, why did you doubt?” With a convicted heart, I feel that He is asking me this very question today. Friends, I don’t want to be one of little faith. I don’t want to be the one who always has to second-guess herself or to be my own worst critic. I don’t want to have to wonder if this blog is going to be approved by those reading it. I shouldn’t worry about that, but I do. The thing is; the one who knows this area of weakness in me tries to make me believe that the doubts are fears are real. This is where the battle begins. Thankfully, we all have a great weapon at our disposal, and that is the Word of God and the power of prayer! I don’t know why I do it Lord, but I am sorry for my lack of faith, the second-guessing, and the doubt that fills me. Please forgive me. Thank you for reminding me today that even though I am under qualified for this, that is exactly where you want me. Help me to trust and obey! For as I wrote in my first entry, it is not through me but through you that beautiful things can happen. I know Lord that there is no way that I can produce anything that people can relate with unless you have your hand in it. Forgive me for wanting to believe the lies and help me to believe your voice of truth. After you and Peter got back into the boat and the winds calmed down, the disciples proclaimed, “Truly you are the Son of God”, so Lord I proclaim that as well. Use this site to draw me closer to you, to build up my faith, to do a new work in my areas of weakness, and place your blessing upon it. Thank you Jesus! I love you too. Thank you Esther for your many years of dedication to following our story! Thank You John for leaving a comment! I appreciate it! Thank you Michele for taking the time to leave a comment. Yes…Thanks be to God! 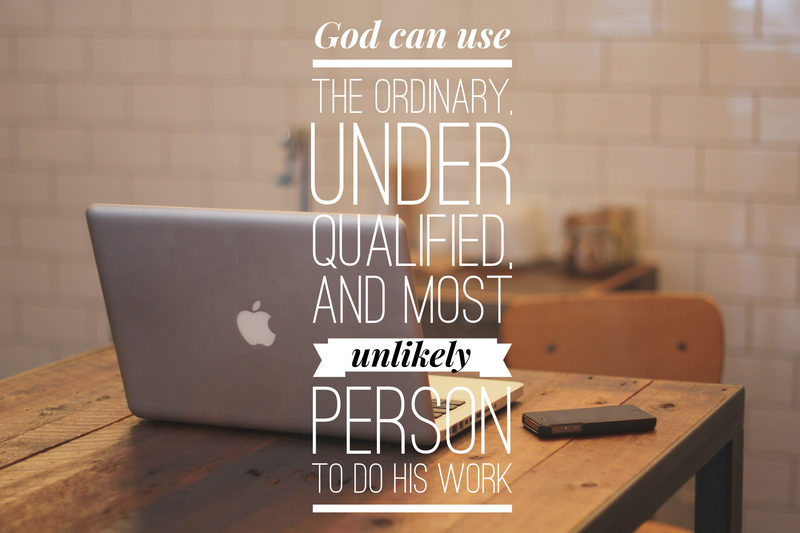 Ordinary, under qualified, Mose unlikely……God’s perfect job description! You nailed it! I have the same inward conversations that you have, only on different topics. Thanks be to God that our sufficiency is in Christ. The title of your blog came up in my mailbox and I asked myself, “why did she use my name as a title?” Then I realized that the title was a description. I’m glad that you told us that you aren’t a writer, you had me fooled. The Lord is saying things to me about all of this that you wrote. I got into reading a book titled, “The Truest Thing about You: Identity, Desire, and Why It All Matters.” As well as a study “When You Do’t Desire God.” Then your blog. All three well written and hitting home. I do believe that the Lord is very actively building, and building up, His church today–let’s stay alert!